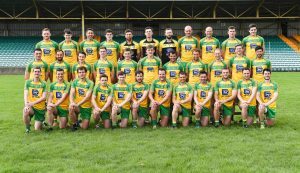 Donegal manager Rory Gallagher has named an experienced starting 15 for Sunday’s Ulster Championship game versus Fermanagh, while handing a debut to goalkeeper Mark Anthony McGinley. McGinley, from the St Michael’s club in Dunfanaghy/Creeslough, is the only debutant, and he takes up the position vacated by two time All-Star goalkeeper Paul Durcan who has emigrated to the Middle East. Team captain Michael Murphy has shaken off an ankle injury to make the starting selection, and he is joined in attack by Patrick McBrearty and Martin O’Reilly. The half forward line of Leo McLoone, Martin McElhinney and Odhrán Mac Niallais, has height and ball winning ability aplenty, and will supplement the efforts of Rory Kavanagh and Hugh McFadden at centre field. McFadden will be expected to fill his customary deep lying role. Frank McGlynn lines out at centre half back, flanked by Ryan McHugh and Tony Thompson. Karl Lacey moves back to the corner, with Neil McGee at full back and Paddy McGrath in the other corner. Eamon McGee misses out on a position in the starting XV. Neither is there a place for Eoin McHugh, who impressed in the league before missing the later rounds due to injury. Sunday’s Ulster quarter final against Fermanagh in Mac Cumhaill Park throws-in at 2pm. The winners will play Monaghan in the provincial semi final, while the losers will travel to play Wexford in the first round of the qualifiers. The team is: Mark Anthony McGinley; Paddy McGrath, Neil McGee, Karl Lacey; Ryan McHugh, Frank McGlynn, Anthony Thompson; Rory Kavanagh, Hugh McFadden; Leo McLoone, Martin McElhinney, Odhrán Mac Niallais; Patrick McBrearty, Michael Murphy, Martin O’Reilly. Team photo: courtesy of Geraldine Diver.